Traditional french toast recipes have a delicious sweet flavour, but the french toasts I make for quick & easy nourishing meals have a savoury blend with vegetables. I personally love a well constructed omelette served with veggies or salad, however the kids prefer a bread – base. And serving eggs on toast regularly can grow bland very quickly! 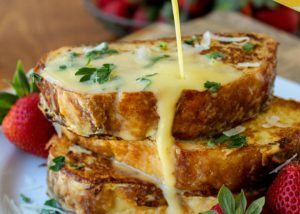 The same can’t be said for french toast, albeit the similarity in ingredients, so that’s where the savoury french toast with veggies meal was born. Heat your pan to medium and add olive oil. In a bowl, whisk the eggs. Add the milk and continue to whisk. Add the butter, zucchini, baby spinach, cheese and salt & pepper, continue to mix until its well combined. Dip bread into the mixture allowing it to soak for a 2 minutes, coating both sides (one piece of bread at a time). Once the bread has soaked, place it on the pan and using a spoon, cover the top of the bread with 1- 2 scoops of mixture – enough to cover the surface of the bread. Add 2-3 slices of roma tomato on top and carefully flip this side to be facing the pan. After approx 2 -5 mins, the mixture should be cooked on the underside and melted to the bread – it can be flipped to toast the other side. Cook this side for approx 2 mins or until browned. Serve with crisp garden salad or our favourite cucumber, avocado & lime salsa.